Following on from my last piece describing the DSWA Pinnacle award and One World Garden, for which I received my first Pinnacle award, I will this time describe the work at Brackenrigg in Cumbria for which I received a second Pinnacle Award. 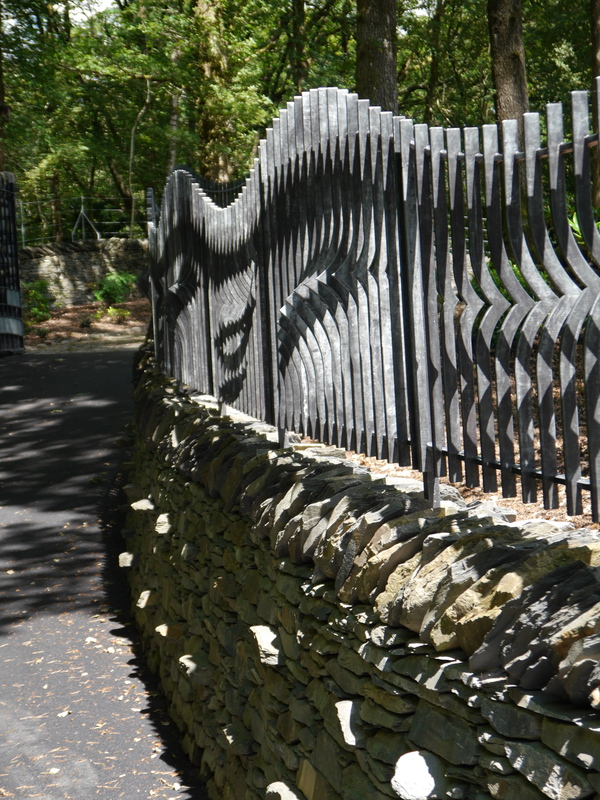 This project consisted of the construction of extensive boundary walls and garden features. When I was first approached by the designer to tender for the work I actually refused to be involved in the project due to the specification that had been drawn up by their structural engineer. I fundamentally disagreed with the the use of concrete foundations and the need for piling on some of the large retaining walls and regarded the section of all the proposed walls to be too narrow. The designers were obviously rattled by my response and requested a site meeting to discuss my misgivings. At this meeting I explained that dry stone walling was a tried and tested method of construction that did not require concrete foundations of piling in order to function satisfactorily. I also advised them regarding the ratio of height of wall to the width at the base and how this relates to the width at the top of the wall. All this only goes to show how important it is for architects and designers to involve an experienced craftsman at the design stage to advise them on what is possible and best practice. Eventually a specification was agreed upon and I was awarded the contract. 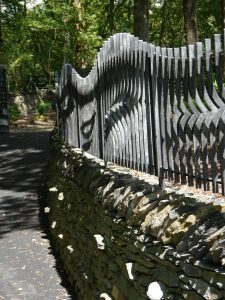 The first phase of the work was to construct a boundary around the property; this included two large sections of retaining wall, 2.5 metres high in places. It is worth mentioning that all the boundary walls were required to be 1.2 metres high on the inside face of the garden side of the wall. 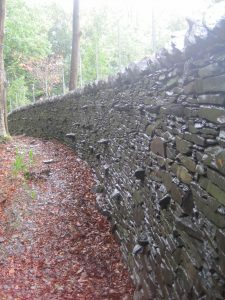 The outside face of the wall varied in height due to undulations in the ground and some of the large retaining sections were up to 2.5 metres high where they crossed large hollows in the terrain. These sections were built as free standing walls and then back filled on the garden side to create level ground within the garden. All these walls were to be fitted with steel stanchions to accept wall top wires increasing the height of the boundary to a level that would exclude deer from the garden, provision was made to fit these later when the wall was complete but before the copings were added. This was done by cementing a 300mm long piece of 100mm plastic drain pipe into the top lift at the correct centres. The plastic pipe could be removed leaving a circular vertical hole in the top of the wall into which a stanchion could be grouted. 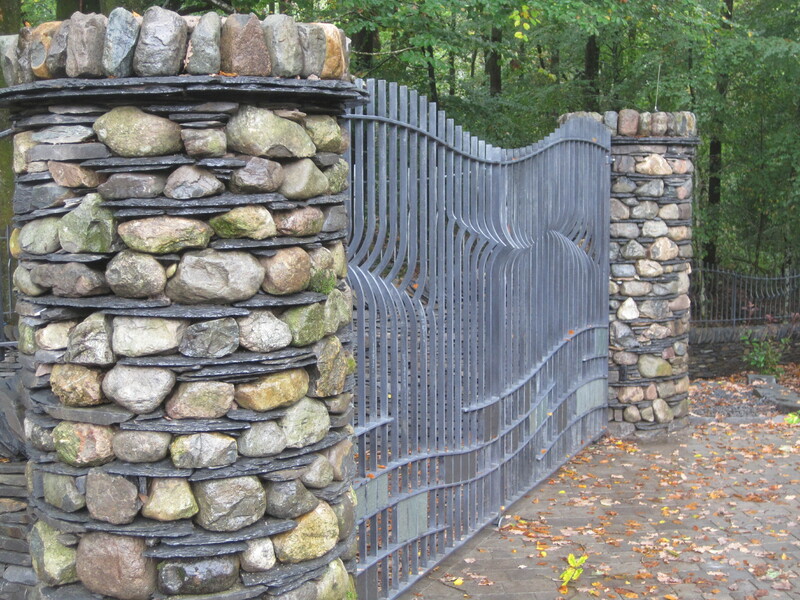 Another section of roadside wall was to have steel railings fitted; this was achieved by fitting the railings on extended posts that were fixed securely in to the ground, the wall was then built around them. 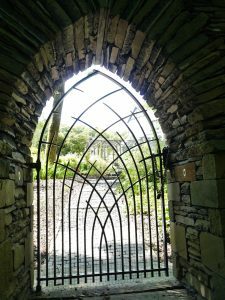 At the two entrances four 1metre diameter circular pillars were built, these were constructed from round river cobbles and Lakeland slate. 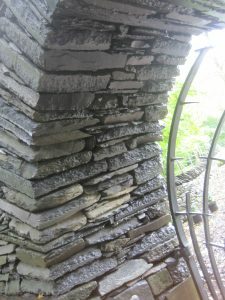 The slate was dressed to the correct radius to help maintain the circular appearance. In the centre of the pillars there were square section steel pillars from which the gates were hung. Due to these steels being square I could not use a string line as a guide to build to, so a plywood template had to be used. A fifth pillar was built at a corner where the wall changed height, due to the change in height this pillar was 2.5 metres high. All these pillars were built using mortar due to the height and type of stone. 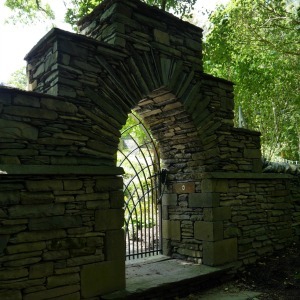 Within the boundary provision had to be made for pedestrian access in to the adjoining woodland so a gateway was incorporated using stone reclaimed from a derelict building that had been on site. The use of this stone was a discrete nod to the previous buildings now demolished. 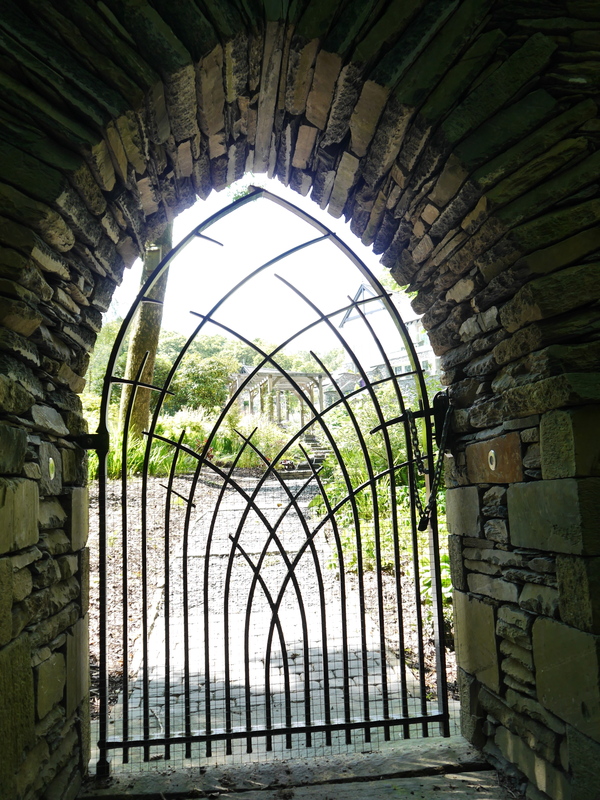 Their was just enough stone available to build a gothic arch incorporating a beautiful iron gate built by Chris Brammall an artistic blacksmith that I have collaborated with on a number of projects. The slate the arch was constructed from can be split to make it thinner but does not dress well in any other direction so the voussoirs were left at random lengths and walled inbetween. 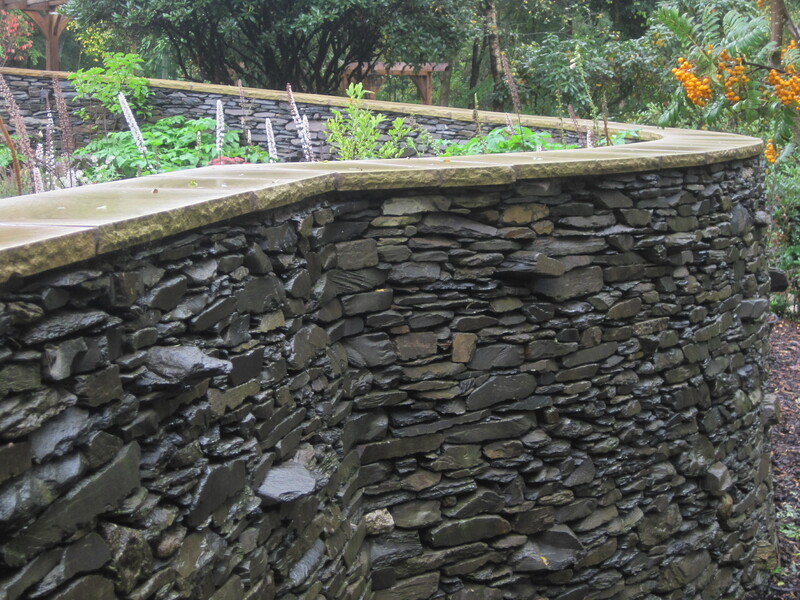 Further to the boundary wall, phase two consisted of a sunken walled garden including a stairway. At one end the sunken garden was to terminate in a round end, from above the plan of the garden is similar in shape to a key hole. 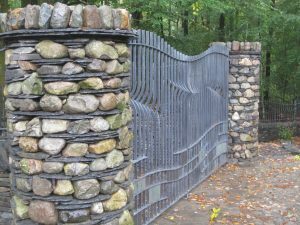 The intersection of the curved wall and the straight wall was incredibly difficult to maintain due to being unable to shape the stone. 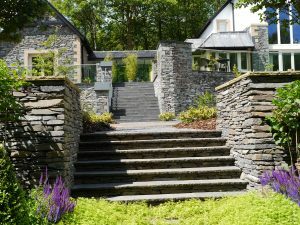 The stairway and wing walls were constructed by Simon Carrol as part of his part A features as he was attempting his DSWA master craftsman’s test while completing a training bursary with me. Again all the walling stone and step trees were Lakeland slate although on this occasion the flat copings were sandstone, matching some detailing on the property. 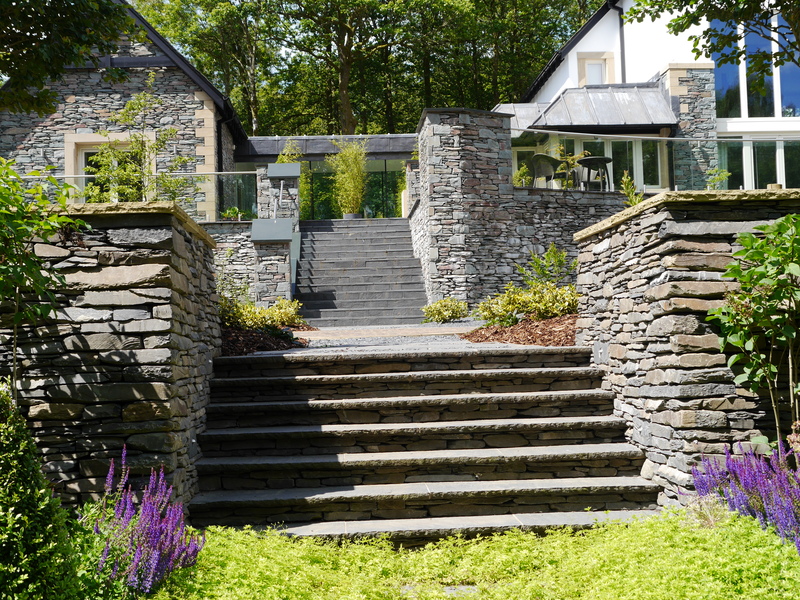 In total the work took over twelve months and required over one thousand tonnes of stone, all the slate was Burlington Blue supplied by Burlington Stone from their Kirby in Furness quarry and the sand stone was supplied from Marshall’s from Shepley Quarry. The project was successfully submitted for a Pinnacle award in 2013 and the award made at the DSWA – GB annual general meeting in 2014.